Survey of 100 Swedish manufacturing companies on how they regard the area of IoT. Telenor Connexion has commissioned research firm Norstat to survey 100 Swedish manufacturing companies on how they regard the area of IoT. A market that is at the forefront of the global development. The development of the Internet of Things (IoT), connected things and machines that communicate with each other to perform completely new tasks, is already in full swing. Click to download the full report and learn more! A dramatic growth in the coming years is predicted, especially with the traditional manufacturing companies, which are currently undergoing major changes to exploit and adapt to the opportunities created by the new technology. IoT also gives rise to entirely new businesses and industries. Telenor Connexion, the leading enabler of connected business solutions, asked research firm Norstat to survey 100 Swedish manufacturing companies on how they regard the area of IoT. A market that is at the forefront of the global development. The interviews confirm that this development is still in its infancy; Methods for developing products and services based on IoT have yet to be established; companies choose to place the IoT responsibility on completely different internal roles; reasons for introducing IoT technologies in operations vary widely; and there is still uncertainty about when the great merits of IoT will come. 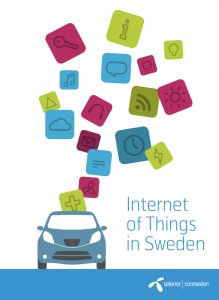 In this English summary of the original Swedish report, you will gain insights on the challenges and opportunities brought by IoT. The aim is to inspire and guide current and future players in this development. The survey by Telenor Connexion shows that a majority (77 per cent) of Swedish manufacturing companies have introduced IoT solutions, or plan to do so within the next two years. There are many different types of applications, from remotely controlled machines to connected vending machines and safety alarms. The main reasons for companies to invest in IoT, according to the survey, is to create an improved product or service to the customer (61 per cent), achieving cost savings (36 per cent), or to create a new revenue source (34 per cent). service or service to the customer. IoT a matter of IT? At 23 per cent of the responding companies, the IT manager is ultimately responsible for the IoT area. In just over one in ten companies (13 per cent), however, the responsibility lies on the CEO and in as many cases, it is the product manager. 12 per cent say they have not yet decided upon this or that it is unclear. There is therefore no clearly defined role with responsibility for driving IoT in Swedish companies. One plausible reason for this is that the area is still so new that such a role has yet to be established in many companies. Of course, other contributing factors to this are company size and business focus. As more companies realize that IoT is not solely a technology issue, but affects the entire business and the organization, the responsibility role is likely to become clearer. Additional responsibility roles for IoT mentioned by the companies in the survey include R&D manager, technical manager, product manager and purchasing manager. According to estimates by network company Cisco the number of connected devices will exceed the number of people on earth at the end of 2014. Several analysts have attempted estimate the future growth of the IoT market, but definitions, market boundaries and estimates vary widely. Most analysts believe, however, that between 26 billion (Gartner) and 50 billion (Ericsson) devices will be connected to the Internet by 2020. This means a doubling in just a few years, at least.